Combine the latest hit sonds with thumping multiplayer rhythm-action gameplay in Invector - designed in collaboration with hit producer Avicii. Designed in collaboration with hit producer Aviici, Invector brings together the pulse-pounding atmosphere of a live concert and the frenetic, competitive gameplay of a classic rhythm-action game, inviting you and up to three friends to duke it out in a futuristic battle set to the beat of today's biggest hits. Each track has been custom built to perfectly match the on-screen visuals with the unique feel of the music and performing better only enhances every beat. Battle across five different worlds in solo or competitive multiplayer, matching your performance with hits from some of today's biggest artists, including collaborative designer Avicii. With three levels of difficulty, Invector welcomes a wide range of players, from occasional gamers and newcomers to video game veterans hungry for a challenge. Launch the single-player campaign mode to follow the story of happy-go-lucky Stella (or, to invoke her full title, Collector Pilot H45H1M). A lone space pilot with a weakness for chocolate, her mission is to gather colourful fragments from across the universe, travelling from one stunning planet to the next in search of great beats and beautiful shards. Player performance brings dynamic changes to both environments and visual feedback, creating a responsive experience. The better and tighter you play, the more colourful and explosive the game becomes. Explore five different themed worlds: Space, Valley, Ice, City and Forest. Each boasts its own colour aesthetics, offering rich variations and beautiful settings specifically designed to complement the music. 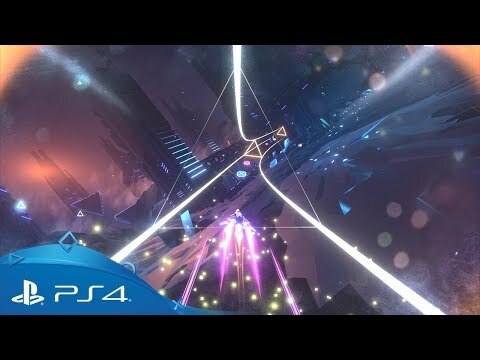 Buy Invector on PlayStation 4. Take your swing at golfing glory as a classic PlayStation series makes it colourful PS4 debut.